Professor Crump has been entertaining for over 25 years. 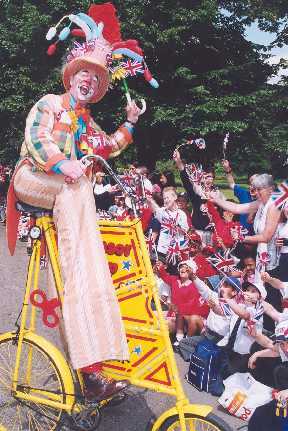 He adapts his clowning to fit any situation aided by a stilt-bike, scooter, puppets, balloons and giant props. Appearances include Circus Krone, West End Show Barnham, Tv - The Fimbles, Sooty Show and his own show Antics Roadshow. Recently he appeared at the Queens coronation childrens party at Buckingham Palace.